Beautiful, youthful-looking skin doesn’t happen by accident – it happens by appointment. The best way to maintain a beautiful glow is to keep regularly scheduled visits for topping-up on age-defying procedures, such as re-surfacing, chemical peels, and injectable fillers, which improve tone, texture, and clarity. Patients love non-surgical skin care because it offers amazing results with little to no downtime, and their new look can be maintained through easy and quick appointments. At Capital Facial Plastic Surgery, we make 12 months of beauty convenient and affordable. Our Year-Round Beauty plan includes your choice of the below topical or injectable procedure each month for a flat fee. Many patients may seek treatment intermittently to manage cost, but we make it possible to return every month while giving patients the confidence in knowing they’re saving money. 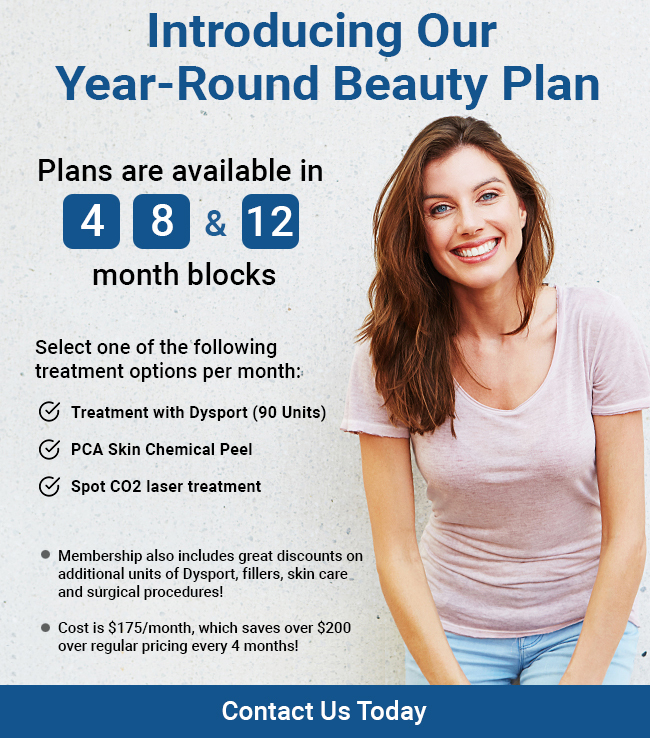 Patients who choose at least four months of the Year-Round Beauty plan save hundreds of dollars on non-surgical cosmetic procedures and the cost benefits continue for those who enroll in our eight or 12-month blocks. In addition to flat fees for your chosen monthly procedures, members of our Year-Round Beauty Plan enjoy exclusive discounts on additional injectable fillers, professional skin care products, and even surgical procedures. We make it easy to access the care you need to love the way you look and keep your confident radiance all year long. Get started today by calling to learn more about enrolling in our Year-Round Beauty Plan today.